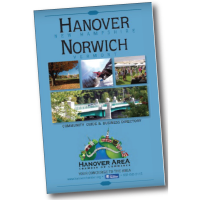 The Hanover Area Chamber of Commerce office welcomes Linda Garrett of Town Square Publishing, the publication house and a member of our chamber who produces the glossy, full-color Community Guide & Member Directory for Hanover, NH and Norwich, VT.
Linda will home base in our chamber office as she works with staff to create content and visits local businesses to offer opportunities for ad placements. There are a several ad options; check out the PRICING GUIDE to see which one fits your budget. The ads are open to all businesses in the area. Our chamber president, Tracy Hutchins, has created a distribution strategy to enhance the reach of the directory and guide, and ensure that our members are well-represented as locals and newcomers seek area information. Download and learn more about the DISTRIBUTION PLAN.